to swim! With Peyton testing out of her last swim class just last week, Hailey now enters the pool for her first full fledged swim lesson. She's been watching Peyton attend swim lessons for years so she knows sort of what's expected at swim class so I think that helped ease any swim anxiety. Although she was worried about "getting her eyes wet" but then I reminded her that she'd be wearing goggles and all was well again. 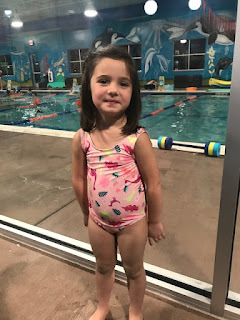 So on Friday, she waited (less than patiently) asking every minute if it was her turn yet to wait by the door for her swim class to begin. Then she told me she knew where Lane 1 was so I didn't even have to go in with her! Is she for real? Of course I'm going in with my 4 year old on her first day to meet her teacher. I told her it's probably best just this first time and she can go in by herself every lesson thereafter. She relented and walked past a girl in her class screaming and clinging to her mom's leg. She said hello to the teacher and calmly sat down on the ledge of the pool to begin her swim lessons. She did great, waiting her turn and following her teacher’s directions. Every so often she would look over at us and I would flash her the thumbs up to let her know how awesome she was doing. In fact, Austen and Peyton were so excited to watch her too that they put down their own iPads to observe her independence. 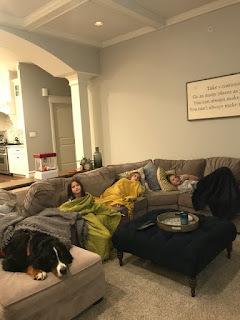 It was different for them being the ones watching instead of the ones doing (as Hailey's soccer and gymnastics classes are when they're in school). But, you could see how proud they were of her and even told her so after class ended. 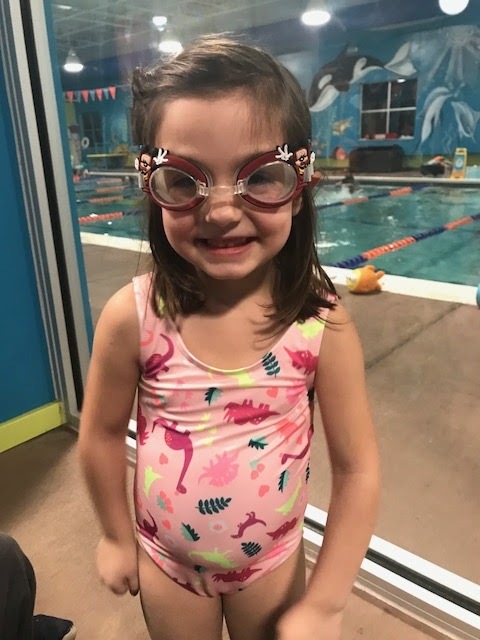 So swim was a success for sure - only 3 more years to go before she hopefully passes out of all the levels! At least that's what I told Austen, Peyton and Hailey last week. You see we are in the process of building a beach house. One that we bought land for a year after we were married - before our kids were even born so it's been a long time in coming as we wanted to make sure we did it right and had everything else before we added on this nice to do (but not a need to do). Well, the time is right now, but building a beach house costs money not to mention the kids want a pool too. So I asked them what they wanted more - a beach house or me staying home. Hailey right away chimed in with a beach house. Peyton contemplated a bit longer before saying she wanted me to stay home. Okay, Austen, I said - you're the tie breaker. After telling me I was lying and that I wasn't going back to work he refused to answer the question before breaking down and telling me he didn't want me to go back to work. Between his full on sobs, he shouted that of course Hailey wanted the beach house because she didn't remember me ever working. I suspect Peyton didn't really recall all that much either as she was 4.5 years when I left. But, Austen, he remembers. 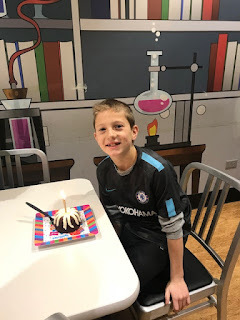 He remembers us living here and me leaving to take the train before he even woke up in the morning and then getting home right before dinner when everything was a rush to get homework finished and bodies bathed before bedtime - and that's when he didn't even have as many sports as he does now. It may have been a little bit mean to play this game (as I'm not really going back to work) but it's good to know you're needed too (and appreciated). They want me (or at least Austen and Peyton do) over a nanny or day care. And, I'm so glad I made the choice to work when they were younger as I suspected they wouldn't remember much of those years but now they want me here (and I want to be here too). The years are short and growing shorter and before I know it they'll be gone. So I'm all yours Austen (and Peyton and Hailey) although maybe not til college! Oh, and don’t worry, you can have your beach house too. I was a Brownie/Girl Scout for five years, and I would have done it longer too if we hadn't moved. My troop was the best. We did a lot of fun activities but my favorite thing to do was the camp outs with my troop. My leaders were awesome as they were always taking us someplace fun including the Poconos in the winter (I lived in New Jersey then). Just this year, Peyton became a Brownie so she's following in my footsteps - learning about philanthropy, working together with other girls and earning badges for her work. So far this year, they've donated food, sang Christmas Carols at the library and now are perfecting their sales techniques to sell cookies. Back when I was a Girl Scout, you had to sell 100 cookies to earn a badge. I was determined to get to 100. I would ride my bike all over adding up the number of boxes sold in my head so I could get to 100 or a little over. In fact, when my Dad would help me deliver them, I remember him saying, "You rode your bike all the way over here to sell Girl Scout cookies!?" It probably wasn't the safest thing to do and once I got bit by a dog and didn't want to tell my parents (and didn't but silently hoped I didn't get rabies). Now, it's Peyton's turn to sell them. She only has to sell 30 to earn a badge. Talk about taking it easier on the younger generation! And, she wasn't all that interested in doing so until she learned you could earn a stuffed animal for selling then she got her sales pitch down and went out today to pound the pavement in the snow to sell more. She sold 12 boxes between just 3 houses. At this rate, maybe a few more hours and she'll reach 120! 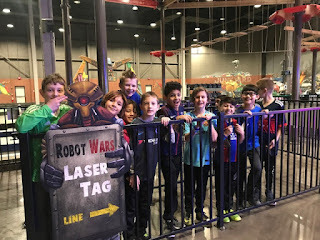 So I needed to plan an unforgettable party for these 10 and 11 year olds. 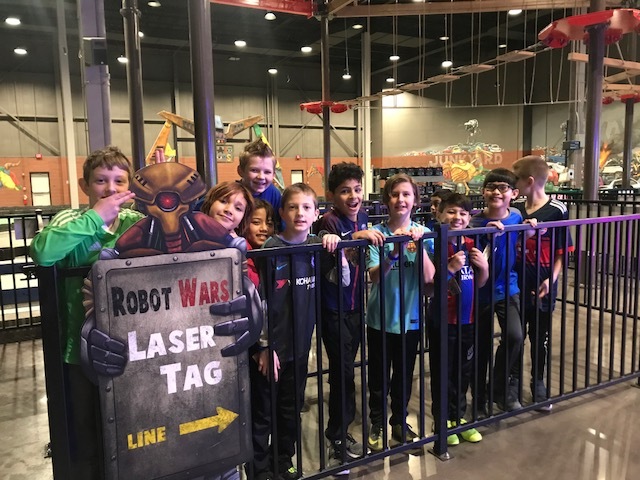 We chose an indoor fun factory that included laser tag, go carts, bumper cars, an extensive ropes course/zip line, rock climbing wall and arcade. We were there for three hours and they were busy running from activity to activity! He said it may have been his best party yet and I think a lot of that was probably because he was surrounded by his teammates/best friends. Cheers to you Austen on almost turning 11 (on Thursday). You're a great kid who works hard at everything you do from school to soccer to any other sport you're playing. You're kind (unless you're dealing with Peyton). You're responsible and you're organized. I couldn't have asked for a better first born. And, yes, I decided to be a stay at home mom because of you (mainly)! And, yes, I promise not to go back to work until you're in college (future blog post material).